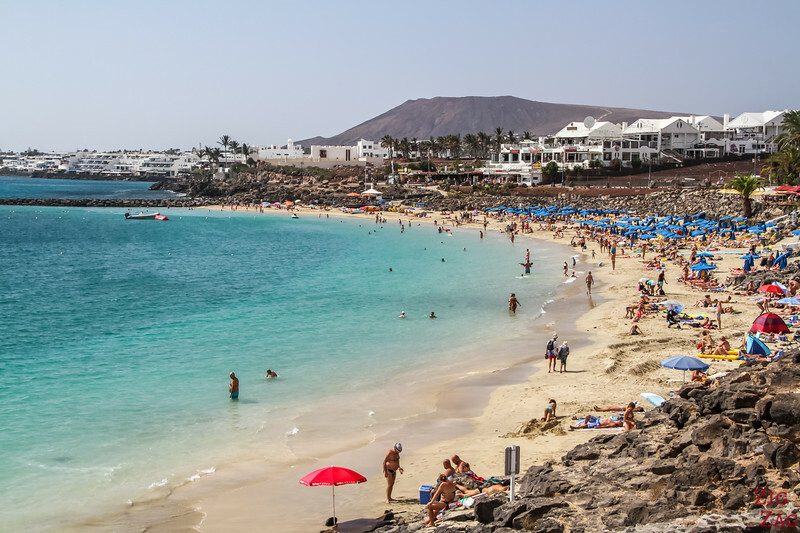 Since I prefer photographing scenery over sunbathing, I am starting with the most scenic beaches to admire in Lanzarote which I have also included in my top things to do in Lanzarote. 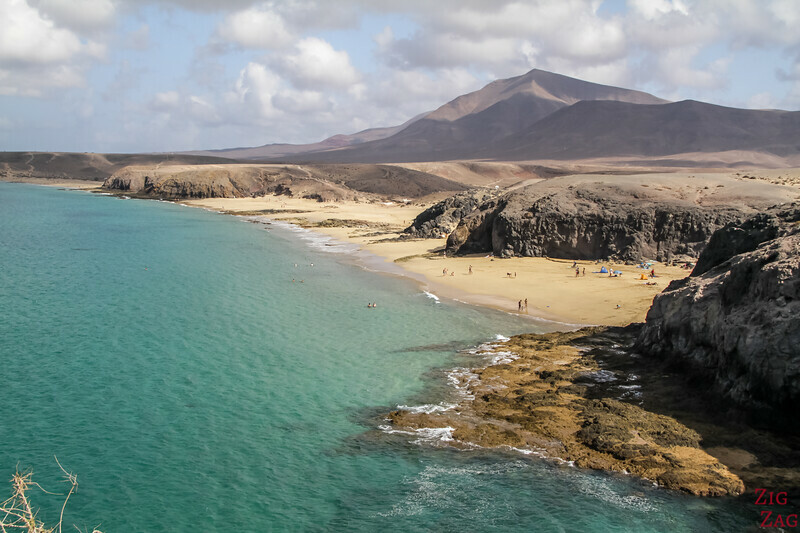 Among the most scenic beaches in Lanzarote is the famous Playa de Papagayo. Located in the wild area in the South of the island, it is a beautiful cove with golden sand and emerald water. Thanks to the steep cliffs around, you are sheltered from the wind. It is the oldest part of the island, geologically speaking and it has fascinating colours. According to many website it is the best beach in Lanzarote, well the most beautiful. I agree that it has something special, probably due to its age and desert-like landscape. The closest places to stay are in the resort town of Playa Blanca. Check out the best rated accommodations in Playa Blanca. 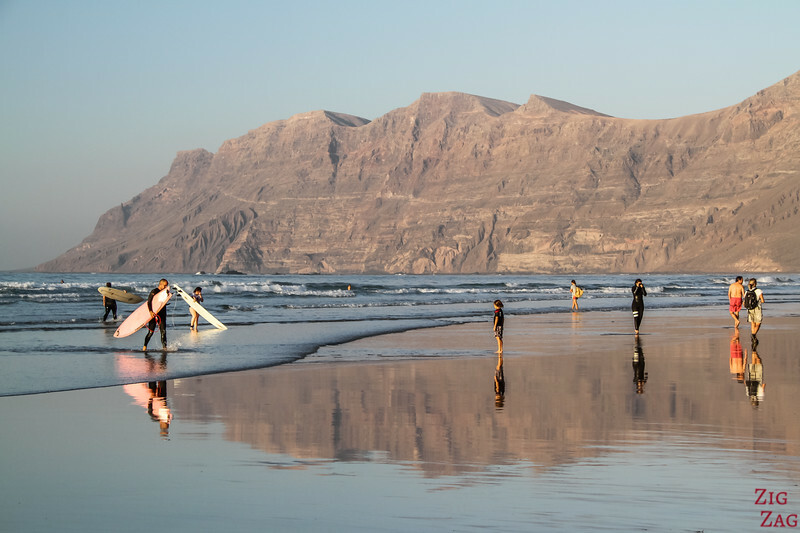 Famara Beach is one of the rare beaches on the West Coast of Lanzarote, because it is either covered with lava or with cliffs. 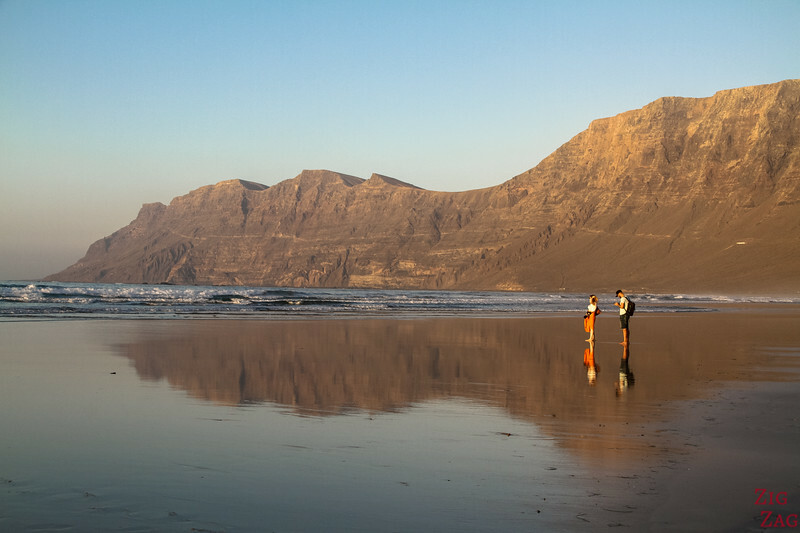 Famara is at the foot of the cliff, a large expanse of sand with small sand dunes. It is considered a photographers' paradise, especially at sunset when the cliffs are hit by the sun, changing colour and reflecting on the wet sand. Many photographers at sunset - this is the place to be! There is nothing right on the beach but the Village of La Caleta de Famara at the South end has some restaurants. Famara has a little village and a "holiday village" with rental options. Check out the best rated accommodations in Famara. I stayed just a few minute drive from Famara in a quiet and isolated guesthouse. Loved it! Check out Finca Las Laderas. Why visit El Golfo beach? This one is definitively not for swimming and sunbathing, but it is one of the most fascinating places in Lanzarote. The half volcano crater meets the ocean and inside, a lagoon has formed and turned green due to the combination of Sulfur and an algae. The colours are spectacular as well, especially at sunset, with the black sand, red and yellow rocks and green lake. They have set up a platform for you to admire the scenery. 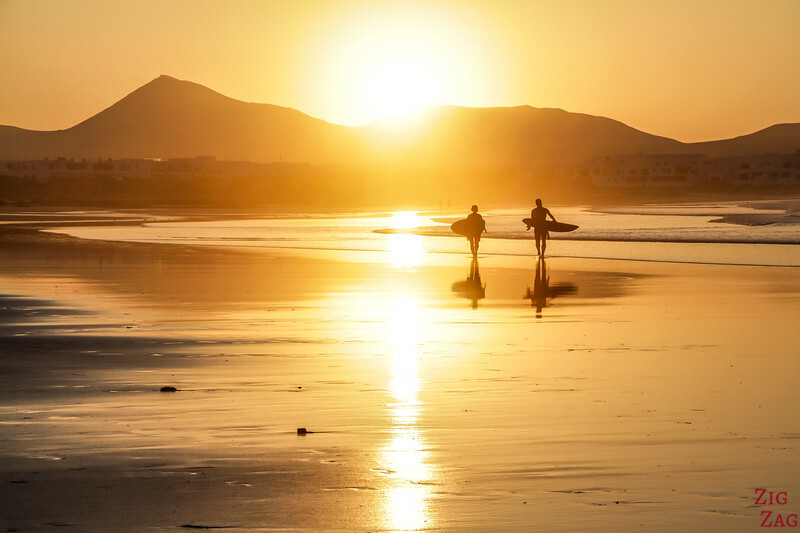 The village of El Golfo on the West coast is considered one of the most romantic places to stay in Lanzarote because you can watch sunset every evening. Check out the accommodations in El Golfo. 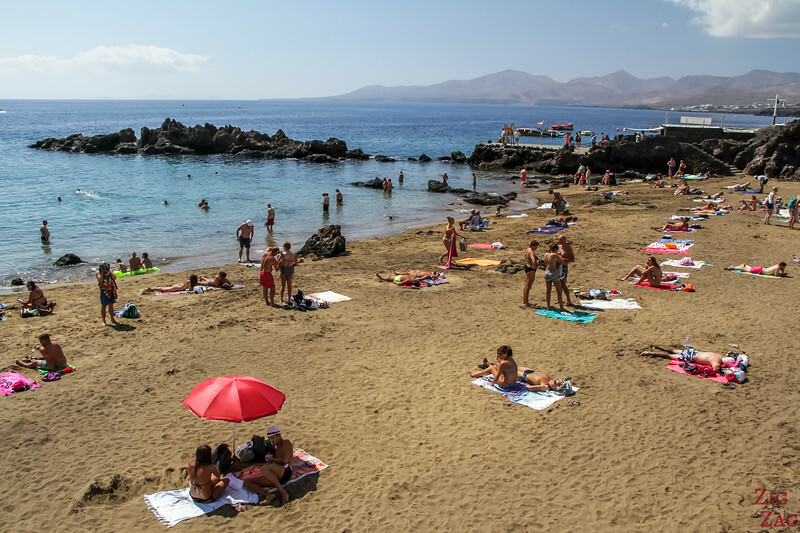 Lanzarote is actually not the best of the Canary Islands for beaches since a lot of the coast is covered by volcanic soil and sand is not prominent on the island. But it is a great place to combine beaches with nature, architecture and art. This is why I love Lanzarote. Now I am going the cheat a little. Because my selection of the next 3 beaches are not technically on Lanzarote. They are on a smaller island North of Lanzarote called La Graciosa. 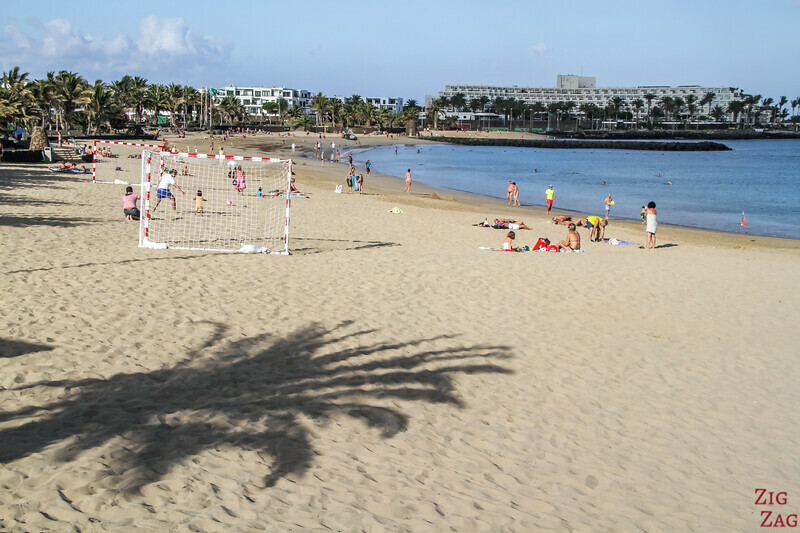 As I said, Lanzarote does not have a lot of sand so the beach there are not the dreamier. 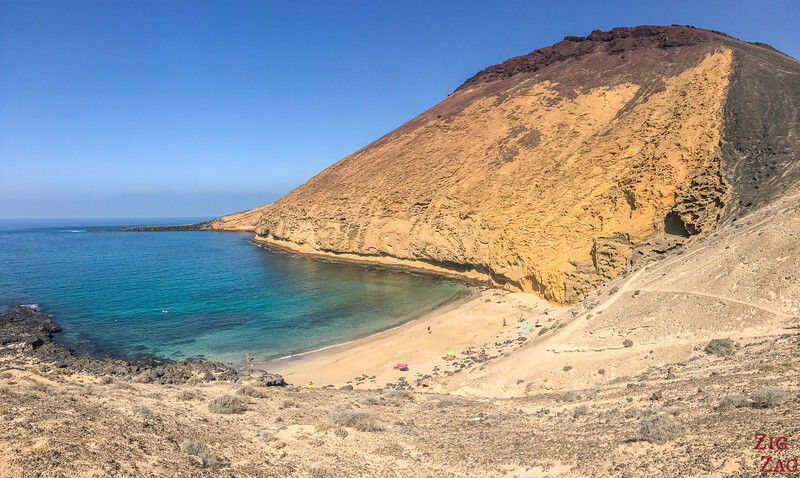 If you are looking for fine sand and turquoise water, I recommend taking the ferry from Orzola to get to La Graciosa and hire a 4WD taxi to reach one of its amazing beaches. Why visit Playa Francesa beach? It is the most visited beaches on the island because it can be reached on foot from the ferry pier. It is a beautiful round beach with Montana Amarilla in the background. Quite a dreamy location to spend the day, isn't it? Bring plenty of water, there is absolutely no shade there or on the way. 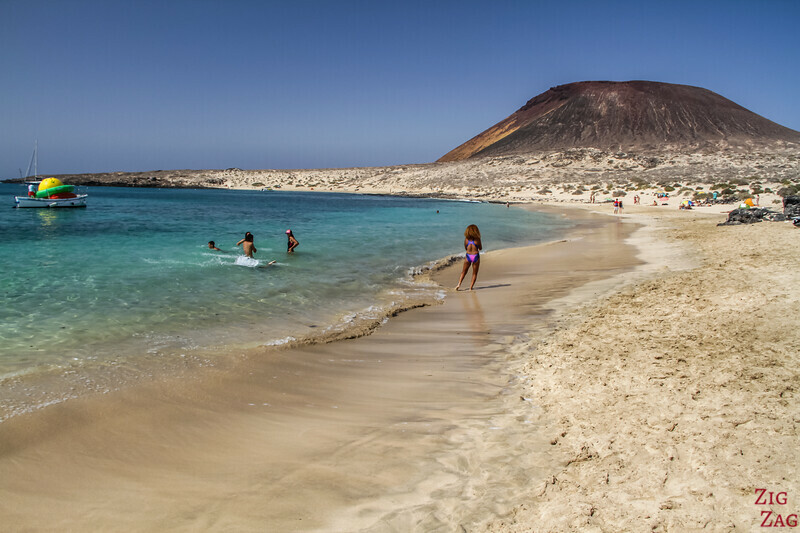 This is the most sheltered beach on La Graciosa. IT is right at the foot of Montana Amarilla with its yellow/orange rocky side shaped by the wind and water. The contrast of the water and the volcano is mesmerizing. Why visit La Conchas beach? 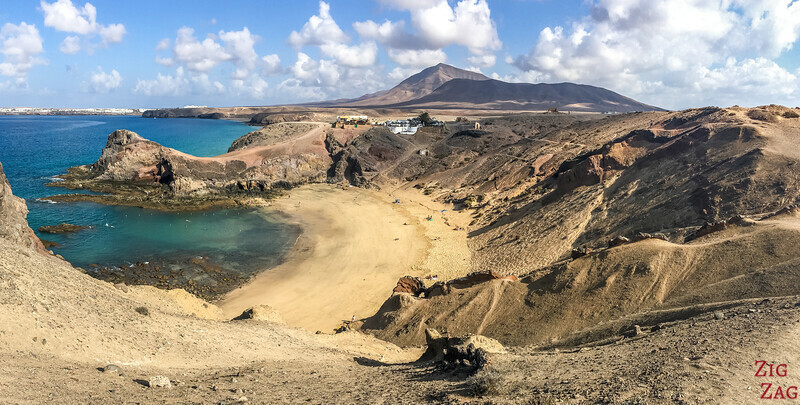 If you are looking of an even wilder beach with lots of space, I recommend going to La Conchas at the North West end of La Graciosa. Hire a 4WD taxi to get you there. There is a vast expanse of golden sand facing Isla de Montana Clara. Photographers will love the sand dunes and the intense colours. If you don't take the 4WD taxi, the walk will be very long under the harsh sun! 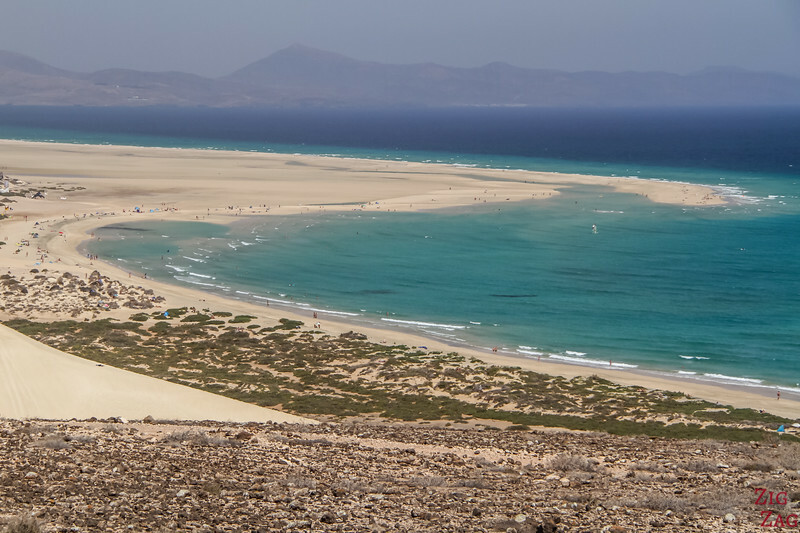 If you want peaceful holidays, far from the crowds and easier access to those beaches, you can spend the night in La Graciosa; There are a few accommodation options to choose from. Check them out. Don't like the big crowds? 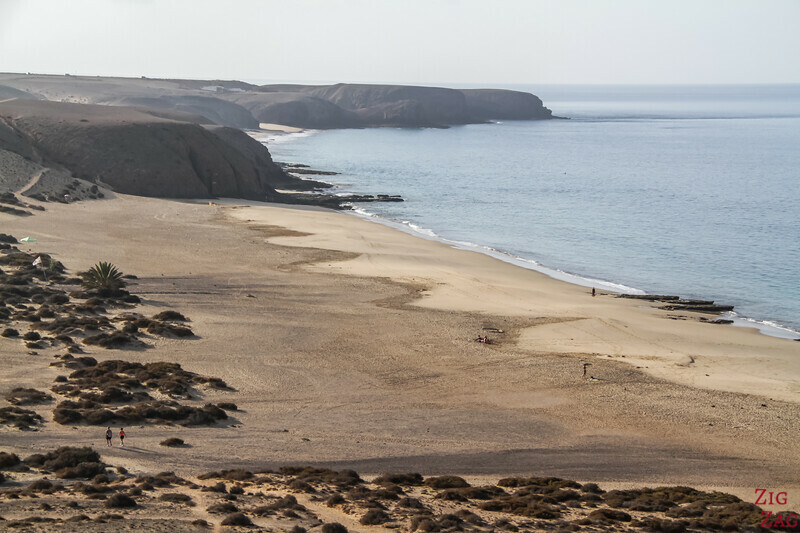 Looking for the quietest beaches in Lanzarote? Well, because of the low number of beaches, there is always people everywhere, especially in high season. But below are a few options where you can feel a bit more quite. 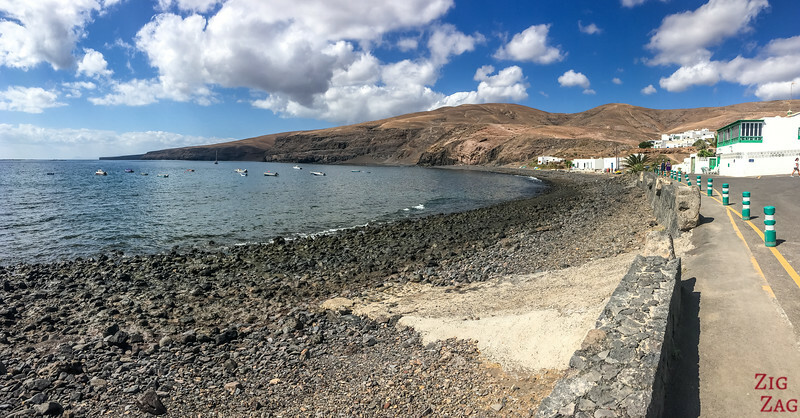 Quemada is a small fishing village on the East Coast of Lanzarote, South of Puerto del Carmen. The main area is black peeble, but if you walk of the South side, under the hills, you can find some black sand to settle on. The area is great for a lunch break with good fish and tapas rich by the sea. Why visit the North Caletones? On the North shore of Lanzarote, is an area mixing white sand with black lava rock. It is quite fascinating. There are several areas where you can park and walk down by the water. The contrasts of colours are great and there is hardly anyone. Most of them are not really practical to lay down or swim because of the volcanic rock, but you can stop at Caleton Blanco where you can find a shallow lagoon which is great to refresh on a hot day. Why visit Playa Mujeres beach? Playa Mujeres is a long stretch of golden sand with great emerald waters. It is between Playa Banca and the famous Papagayo Beach. 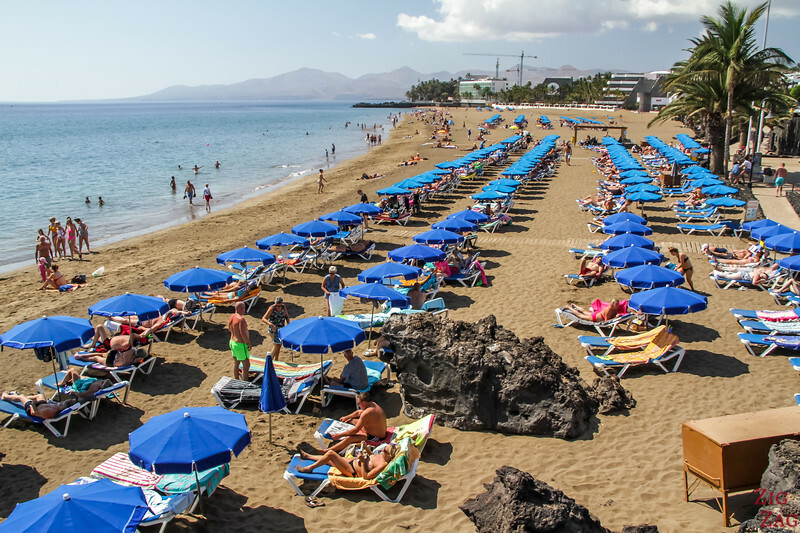 If you want to have all the facilities nearby and don't mind the crowds, then the best beaches in Lanzarote for you are the ones in the resort towns. Playa Blanca has a few sandy areas, some are really not big. 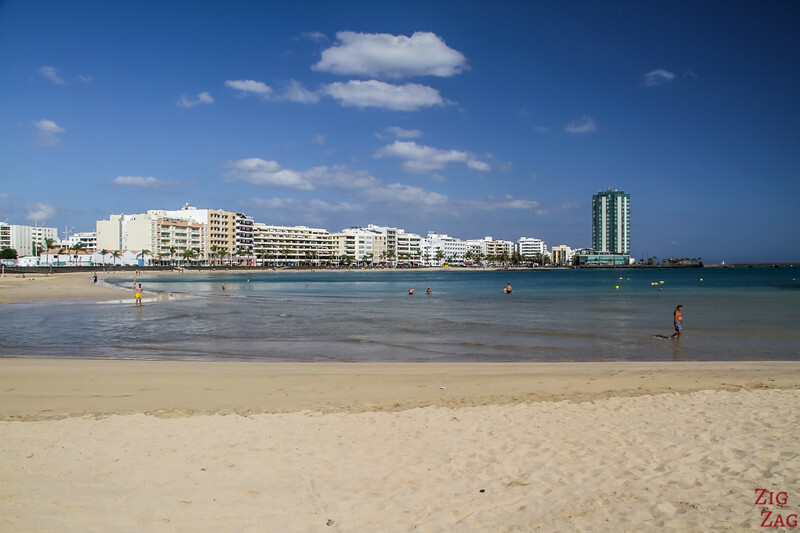 The most famous ones are Playa Flamingo and Playa Dorada. They are right by the promenade that goes all the way along the waterfront to the Rubicon Marina. Puerto del Carmen is the largest resort town in Lanzarote. It has the biggest beaches right in town. It is very crowded at high season but you can find some great options at other times. You can opt for big sandy area that is Playa Grande, or little rocky coves depending on your preferences. Costa Teguise is a smaller town resort North of the Capital City. It is a great location to explore the whole island. And it has a couple of enjoyable beaches with large carparks. I would not go to Arrecife just to go to the beach. But if you are staying there, the central beach is really great with shallow waters and fine sand. Beach + Sunset is really fantastic. So let's go back for a minute to Famara beach, our #2. I want to show you why it is worth visiting at sunset time, especially at low tide. 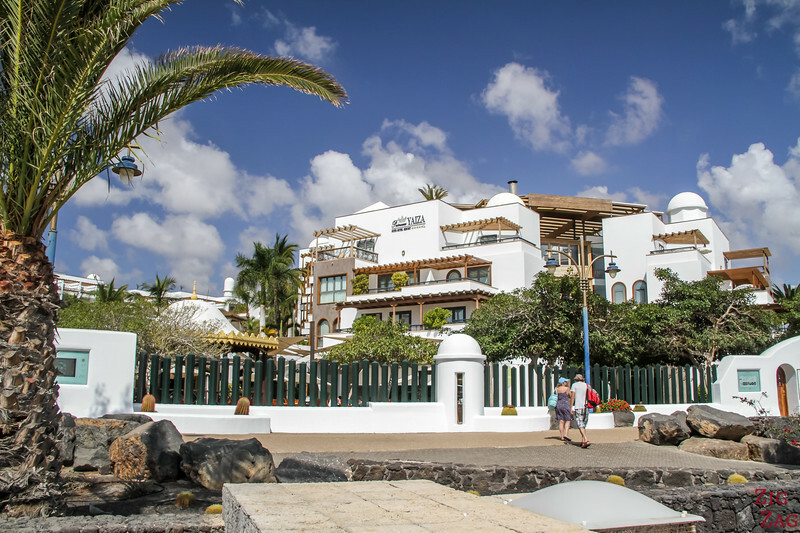 Or check out my complete guide on where to stay in Lanzarote. There is one 100% nudist resort in Charco del Palo in the North East coast: Finca del Mar. There are no animal dangers on the Lanzarote beaches. Jellyfishes are a rare occurence. Your main danger is the sun, any time of the year. Lanzarote is often windy, so you don't always realise how harsh the sun is. Protect yourself and don't spend all day on the beach. And keep hydrated! You can have never ending discussions about going to Fuerteventura or Lanzarote. 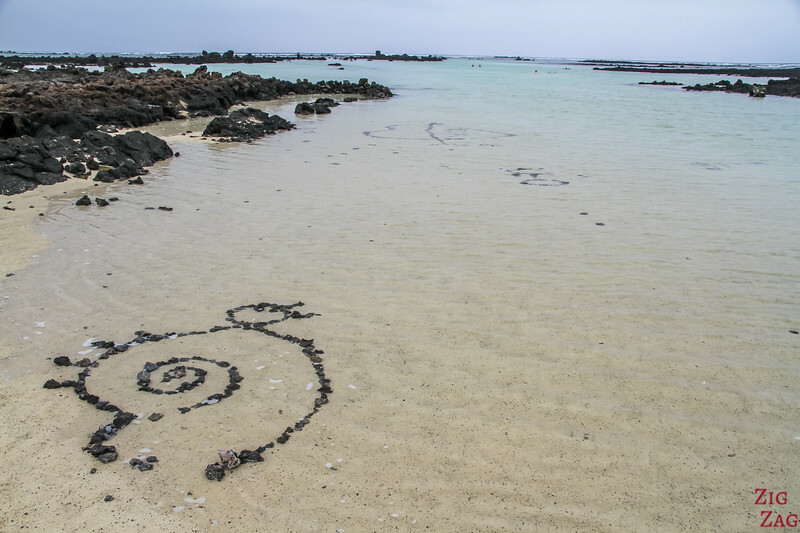 My opinion is that for an overall great time with nature, architecture and beaches, Lanzarote is the best destinations. In the South east coast is the impressive Jandia area with large expanse of fine sand and a beautiful lagoon. 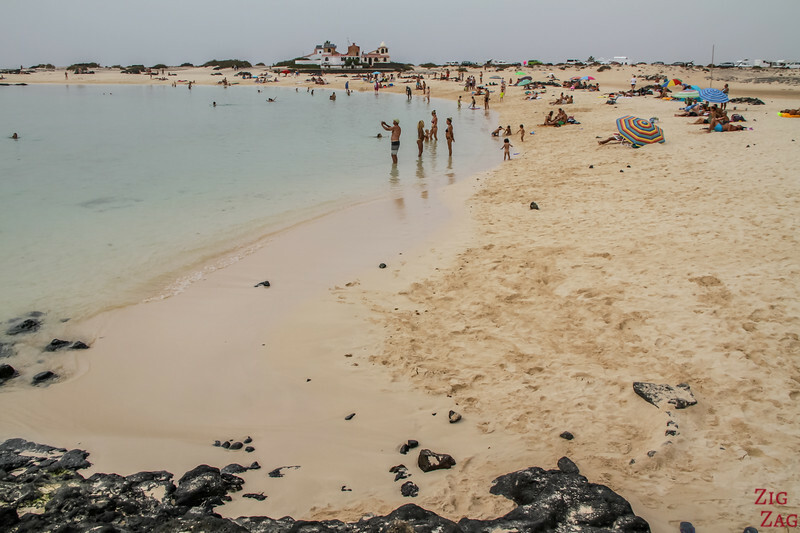 North West are the popular beaches of El Cotillo. Great sand and safe area to stay with the kids. Close of a small town with restaurants. 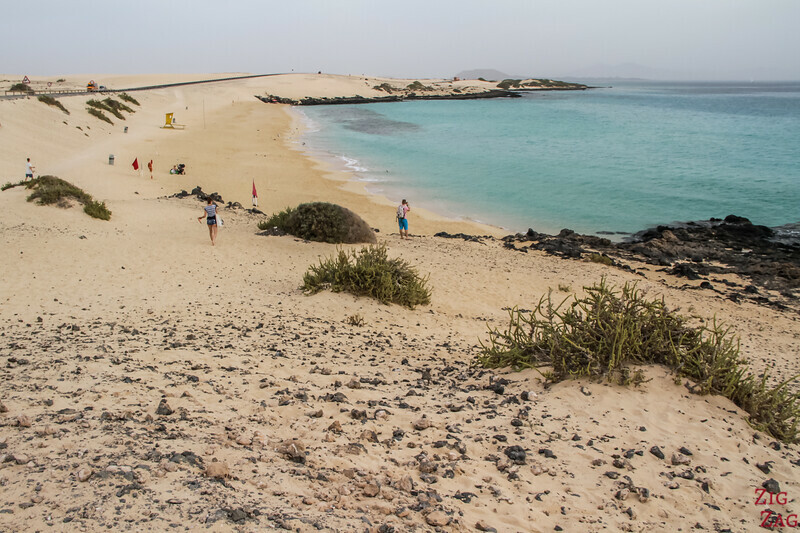 And you also have, of course, the famous Corralejo sand dune park in the North East. The road goes though the dunes. Sometimes you have to walk to reach the sea, but sometimes (as in the photo above), the beach is right by the road. What types of beaches do you prefer?